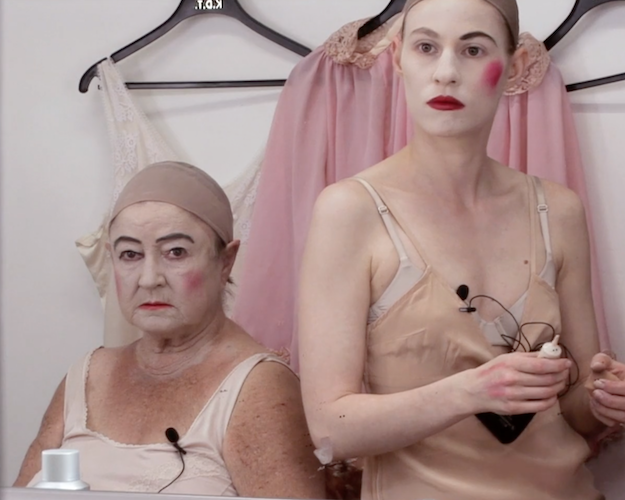 Tova Mozard’s film The Big Scene is a staged therapy session with the artist, her mother and grandmother on the main stage at the Royal Dramatic Theatre in Stockholm. The three women get ready in the dressing room. Wearing pink-colored nightgowns or negligees, they apply their make-up which resembles a kind of exaggerated theatre make-up. They look at themselves and each other in the large mirrors, casually chatting about age, their looks, and death. The women eventually enter the stage and sit down with their backs against the empty audience seats. In the presence of a therapist, they engage in a discussion about loss and the different family roles. From these very personal conversations, compelling stories emerge about sorrow, desire longing, and hate. They reveal a sense of searching and scrutiny about what unintentionally and inevitably continues to travel on between generations - between mother and daughter.